Senator Elizabeth Warren has a problem with Wall Street's new IM program. On Monday, Warren made it clear that she thinks the instant messaging service -- known as Symphony -- is likely a ploy to hide Wall Street's activities from regulators. She sent a sharply worded letter to financial regulators demanding answers. "I am therefore asking you to provide my staff with a briefing on this new Wall Street communication system and how it may impact your ability to enforce the law," she wrote. Symphony is a messaging tool that Goldman Sachs (GS) developed, along with other banks and hedge funds. They've formed a separate company called Symphony Communications, with its flagship product set to launch on September 15. Goldman calls the new IM service a "cloud-based, compliant platform for instant communication." But Warren says her concerns are "deeply exacerbated" by Symphony Communication's public statements. On its website, Symphony claims it has tools to "prevent government spying" and guarantee that "there are no backdoors." It also guarantees "that data deletion is permanent." 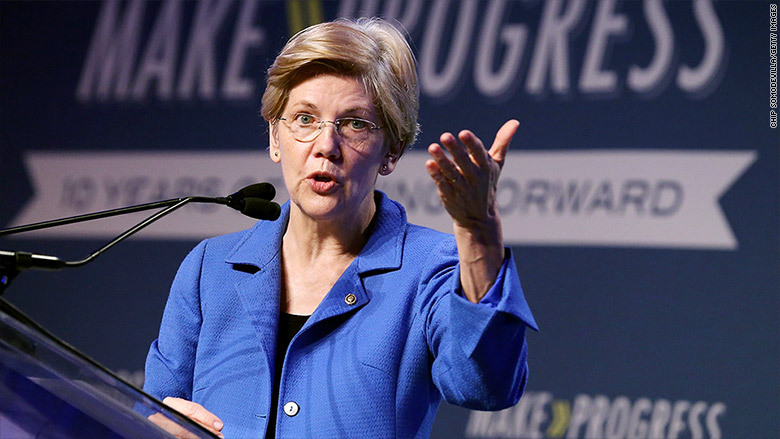 Warren believes all this will make it difficult for financial regulators to obtain records. Online chats between traders and bankers have been critical to catch wrongdoing in the past. Perhaps the most famous case is the LIBOR scandal where traders collaborated illegally to set interest rates that banks use when they borrow money from each other. At times, they would use chatrooms to discuss plans. Those LIBOR rates are used around the world to price trillions of dollars worth of financial products, including home mortgages and credit card rates. When LIBOR goes up, monthly interest rate payments do too. Banks like UBS (UBS), Barclays (BCS) and Citigroup (C) have paid billions to settle with regulators in the U.S. and Europe over interest rate and foreign exchange manipulation. One trader Tom Hayes is going to jail for 14 years over it, and others are facing charges in court. Many on Wall Street have relied on Bloomberg's messaging platform for years or that of rival Reuters. Traders often use Bloomberg and Reuters to get market news and data, so it was easy to just hop on their messaging services and chat with others. After the LIBOR scandal and the revelation that Bloomberg News was snooping on some Bloomberg terminal chats, many banks began rethinking their communication policies and options. The Federal Deposit Insurance Cooperation said it has received Warren's letter and plans to respond. Symphony posted a response of its own on the company blog, saying, "Symphony does not make it harder for government regulators to obtain chats from the firms they regulate."